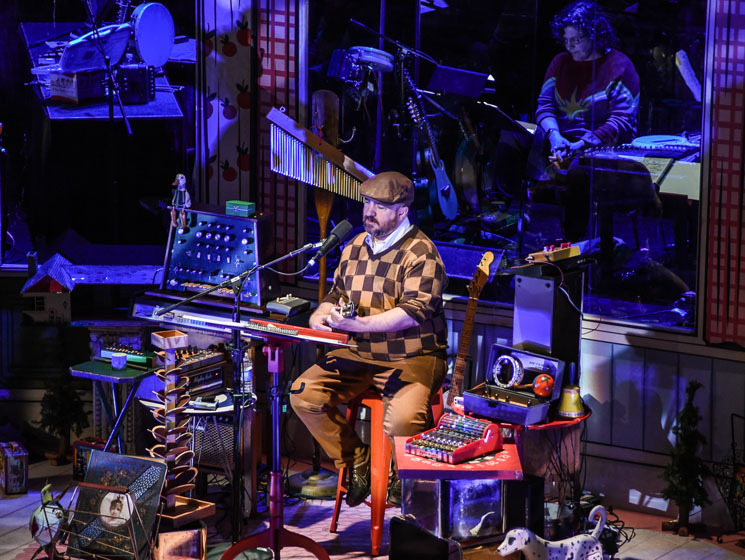 Stephin Merritt is no stranger to ambitious undertakings. The driving force behind experimental pop outfit the Magnetic Fields, among others, is best known for 69 Love Songs, a sprawling series of, well, 69 love songs, which received acclaim upon its release in 1999 for its humour, heartbreak and elegance, even at its whopping three-hour runtime. So when Merritt announced his 2017 album, 50 Song Memoir, featuring one track for each of Merritt's first 50 years, the scope itself was nothing new for the songwriter. What was surprising, however, was that it was a look into the inner workings and history of one of indie rock's most cloistered minds — sure, Merritt's songwriting has always offered clever, heartbreaking musings on the inner workings of human beings, but the man himself was notoriously closed off, shrugging away any attempt at gleaning personal details from his lyrics. Even with 50 Song Memoir long since released, and with each of the songs about to be performed in order at Toronto's Elgin Theatre over two nights, Merritt opened the evening with his typical obfuscation. "Autobiography need not be the same as truth." It was a thesis statement that somehow made a celebration of Merritt's life feel calculated and cerebral instead of spontaneous and heartfelt, and it showed in the production itself. Merritt performed from inside a replica of his childhood bedroom, with his backing band surrounding him on the stage. Each of the seven band members performed seven instruments, each no more than seven times (between the 50 songs), to keep the arrangements eclectic. A video screen above the performers' heads displayed charming, synchronized video clips for each song and for Merritt's monologues, which had been carefully scripted. It came off as live theatre, but Merritt's dry delivery made it all feel a bit too staged. This first of two shows featured songs one through 25, chronicling Merritt's transient childhood, defined by a series of moves and prospective stepfathers to his eventual discovery of music, culminating in an early adulthood punctuated with new wave, young love and the AIDS crisis. Lyrically, 50 Song Memoir distills the events of the last 50 years into a single voice, in stark contrast to Merritt's typical writing style, in which he is often not writing from his own perspective. It's a fascinating exercise that finds Merritt drawing links between broader cultural events and themes (the Vietnam War, the deadly Northeastern United States blizzard of 1978, the AIDS crisis) and his own experiences. Additional context through Merritt's anecdotes added to the scope of the project. Most impressive were the numbers in which young Merritt builds his musical palette — "'76 Hustle 76" and "'81 How to Play the Synthesizer" embodied their respective genres of disco and Kraftwerk-ian synthpop without losing Merritt's guiding voice. There's something powerfully poetic to Merritt singing about his early rock band days while playing the guitar he played as a preteen, and the live show allowed Merritt to engage with his past both through the music and the elements of performance. Merritt's dry demeanour was occasionally overshadowed by the elaborate production. His distinctive, disaffected bass was often obscured by the clatter around him, making it hard to hear his lyrics, the focal point of any Magnetic Fields song. On the night's closing number, "'90 Dreaming in Tetris," Merritt looks back on the AIDS crisis through the lens of Cold War-induced cultural apathy, but all anyone could focus on was the game of Tetris playing on the screen above his head. It was a confusing end to a brisk night — a 20-minute intermission broke up two 45-minute sets, and the vignette-like nature of the songs and Merritt's monologues ensured that the pace never lagged. It ultimately took away from the weight of Merritt's words — but when the strength of his songwriting cut through, it packed a powerful punch.